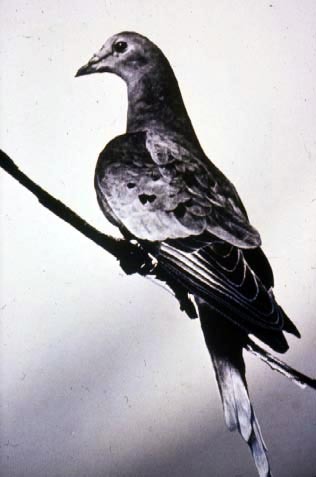 The demise of the passenger pigeon is a tragic example of the effect of human interests on nature. Passenger pigeons once ranked amongst the most numerous birds on the planet. Their flocks were so huge that they could block out the sunlight for days, with their chattering heard for miles. A single tree could hold over one hundred nests. Unfortunately, their survival depended on large numbers. One of the few survival strategies of passenger pigeons was predation satiation. The huge flocks needed large forests to nest in, and each nesting pair would lay only one egg. The pigeons would nurture their offspring, known as a squab, for two weeks before pushing it out of the nest. The helpless squab would then flounce around on the ground until it developed the ability to fly. The forest floor would be littered with hundreds of thousands of helpless squabs — easy pickings for wolves, foxes, weasels and hawks. Yet the majority of squabs would learn to fly before their predators could make a significant dent in their numbers.